This small room has been my studio for the last 34 years. It was built for me as a studio space when we built our house, and has evolved from an austere open room in which I painted into a space that has since been colonized by an accumulation of objects. 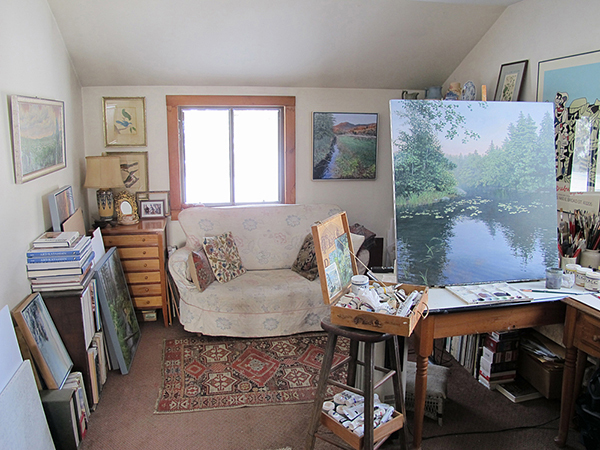 I work on the same table, with the same easel, whether I am doing a large 4′ x 6′ painting or a small 8″ x 10″ piece, with the light pouring in from north and east windows. I needed somewhere for visitors to sit as I worked, so moved in a small couch, and then gradually collected piles of art books, oriental rugs, a china collection, paintings I wanted to keep, framed works like the Dubuffet silkscreen and still life by Janet Manyan that remind me of the breadth of art, family photos, and the digital radio that accompanies my mind as I paint. I could probably clear out many of these tenants but would miss having their company. I’ve turned into a Snow Bird, relocating eight months of the year to the South. The other months, I spend in Maine. Light conditions, ambient temperatures, and cultural definitions are new with every migration. Living away from cultural hubs inspires a sensual and interesting life. 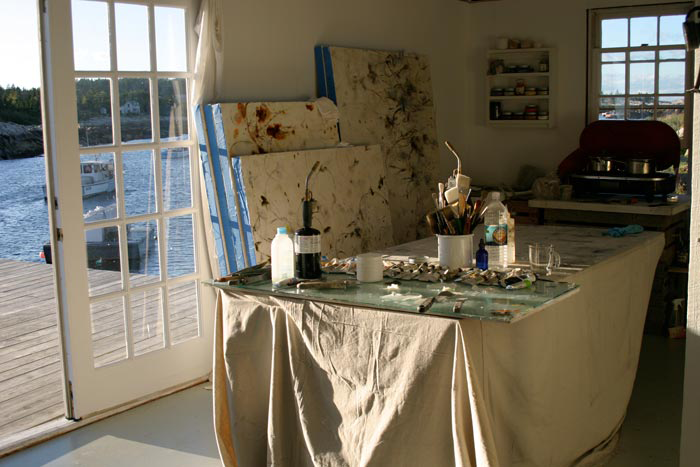 My Maine Studio is a fish house dating back to the turn of the last century. It is small, and since we have limited solar electricity, I work only in natural light. There’s something special about tapping the same light that past great American painters have tapped. We are alone on the island, surrounded by the elements. The isolation allows me to complete a lot of work, and the wildness of the environment inspires me to tap the rhythms of nature in a mimetic way. My Southern Studio is in Columbus, Georgia. 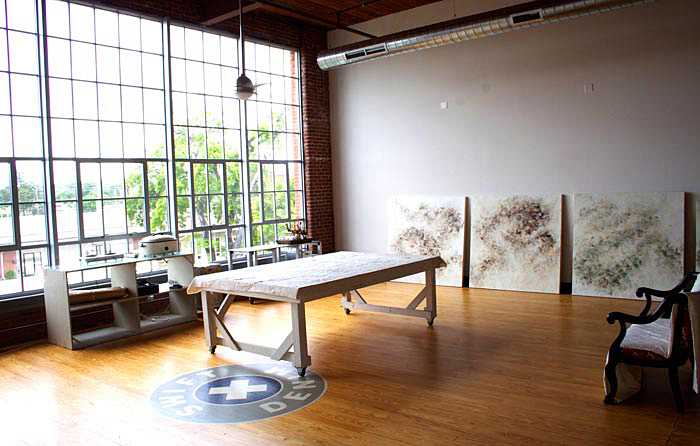 The South is not rarefied, so it allows artists to live and work with an abundance of space and time. My 3,000 sf studio is in a converted cotton mill with floor to ceiling windows allowing optimum conditions for discerning tonal shifts, color, and form. 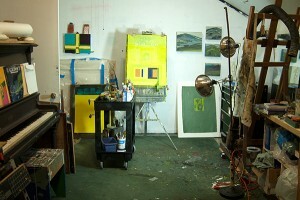 My studio is in the north end of our schoolhouse in Oakland. It is a long, narrow space that used to be the bathroom and woodshed, with a separate door. It is a raw space where I can paint freely, and the long dimensions help me back away from large-scale work. In winter it is warm, with its own Japanese monitor heat source, bright work lights, and a comfy chair that the cat prefers. Early morning is my best time, that space between dream and duty when I have the most clarity. In the early morning darkness, it is easy to stoke the stove, grind coffee, and go sit and breathe in my space. Then I have the pleasure of spreading paint on a surface, or drawing, or thinking about what to do next. The space gets more versatile with rolling work carts, a good ventilation system, and folding worktables for carpentry. After a long workday, there is the waiting piano, and the infinite comfort of books. And in the morning, again, a sense of endless possibility for work and ideas in a room of one’s own.